I've been wanting to do homemade granola bars for months, but just couldn't find a recipe I liked the look of. The one that came most highly recommended used an ENTIRE CAN OF SWEETENED CONDENSED MILK to hold it all together. Now, I like sweetened condensed milk as much as the next person (almost as much as Winnie the Pooh), but let me tell you something about the sticky stuff. It has 22 grams of sugar...per tablespoon. So, for obvious reasons, I opted against that recipe. 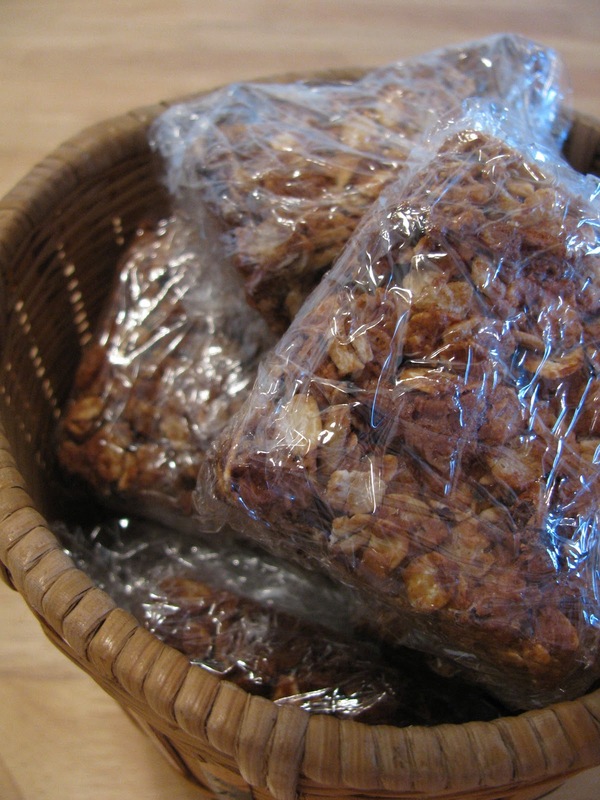 When I found this granola bar recipe on my friend's blog, I was so excited. I made it for the first time last week, and we're already on our second batch! 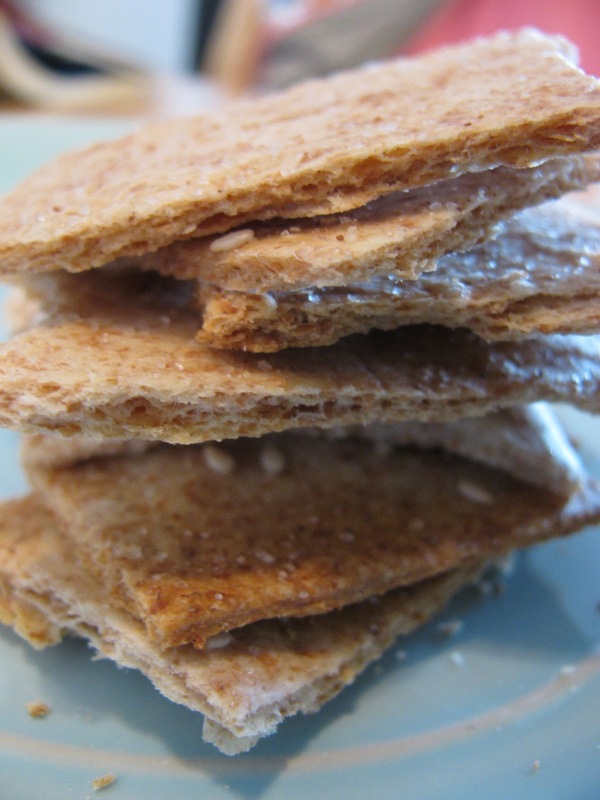 These make great take-along snacks for class/work/gym/errand-running/whatever. They're also delicious for breakfast. And unlike the sweetened condensed milk recipe, these granola bars only have roughly 10 grams of sugar per bar (if you cut them into 15 squares like I do). 1/3 cup chocolate chips (I like to chop mine up a bit so that the chocolate is more evenly distributed.... you could also use mini chocolate chips) - The chocolate is technically optional, but what's a granola bar without a little chocolate? Anything else you want—dried fruit, nuts, seeds, etc. I typically use a mix of sunflower, pumpkin, and flax seeds. I had this meal this summer in Utah and loved it! I knew Mahon would like it too, so once I got back I made it for him. We've now had it a few times, and I can tell it is one that will become a favorite in our rotation! In crock pot, cook roast according to your crock pot's settings with about 1/4-1/2 cup water and your desired blend of Mexican-esque spices. When roast is well-done and falling apart, shred and set aside. In bowl, combine egg and flour. Wash peppers and slice off tops and bottoms. Slice down the middle to open them, and remove seeds and membranes. 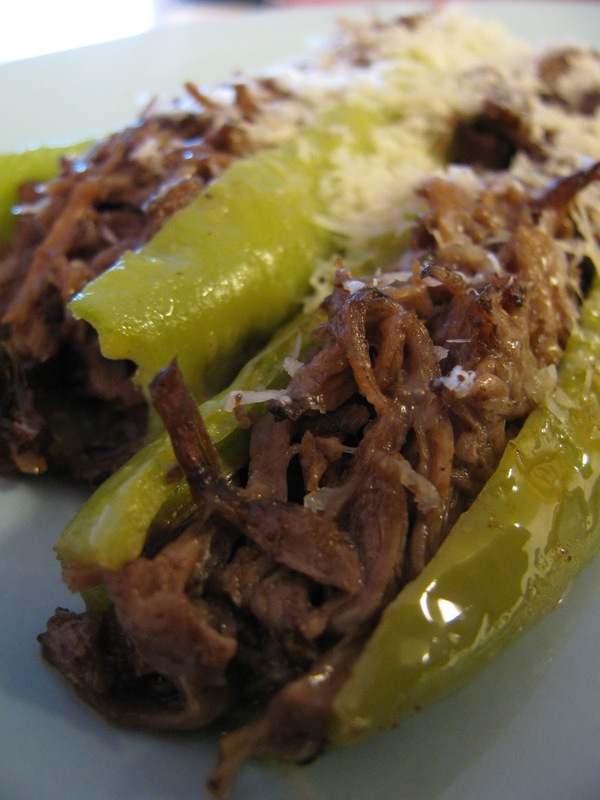 Fill peppers with shredded beef and cheese (stuff them as full as possible, but not to the point where the stuff is falling out, or it will make your life harder during the next step). Heat skillet to medium-high and drizzle with oil or butter. With pastry brush, coat outside of peppers with egg mixture. Place in hot pan and fry until egg is cooked and pepper is tender (1-2 minutes). Transfer peppers to baking dish and sprinkle with more cheese. Broil for 3-5 minutes, or until cheese starts to brown. Enjoy! We had this tonight for dinner along with roasted chickpeas and apples and let me tell you, we were licking our plates! Rating: 5 stars... we make it every week or two! I love pasta, and I love cooking, so it was only a matter of time before I tried making my own pasta, right? It is a HUGE hit with us—it's become one of our regular meals and we have it every week or two. I almost always serve it with a simplified version of the cream sauce from this recipe. The homemade pasta with that sauce is hearty enough that I usually just serve it with that and veggies on the side. Fresh pasta definitely takes more time and effort than store-bought, but the taste is so unbeatable!!! We make a huge batch and it never lasts more than 2 meals! In bowl of stand mixer* with dough hook attachment, combine eggs, flour, and salt. Let mix on low speed until everything is integrated. At this point you will start to have a dough ball forming on your hook, but it will be fairly dry/crumbly and there will be a lot of crumbs left in the bottom of the bowl. Slowly drizzle olive oil in until a lot of the crumbs are moistened and integrated into the dough ball (I usually end up with about 2 tsp olive oil). If you don't want olive oil (which enhances the flavor), just use water. Let mix for another moment to get the olive oil worked into the dough. There will still be a few crumbs in the bottom of your bowl and your dough will still be fairly dry. SLOWLY (you don't want much water) drizzle water into bowl ONLY until the rest of the crumbs are moistened and integrated into the dough bowl (it usually works best to drizzle a little water, wait a few minutes, add a bit more, etc.—if you get too much water, your dough will be very sticky and tough to roll out). If you do end up with too much water and sticky dough, add a tablespoon or two extra flour and let it integrate into your dough ball. You are going for a dough that is not at all sticky—it should be sticking together, but fairly dry to the touch. If you don't get this right the first time, don't worry; it took me a few times to figure out the right consistency for the dough. Once everything is added, allow the dough to knead in your mixer for about 5 minutes. Once it is done kneading, remove the dough and wrap in plastic wrap. Let rest at room temperature for at least 20 minutes (if you skip this step, your pasta won't work). After dough has rested, fill the biggest pot you have with salted water and start bringing it to a boil. On lightly floured surface, roll dough as thin as you can get (if you have a pasta maker, great, use it!). It's tough to get this really thin by hand, especially if you add wheat flour. Ours is usually pretty, um, robust. ;) Using a pizza cutter or pastry wheel, cut pasta into desired shape (because our dough is fairly thick, like I said, I usually try to cut it into very thin strips). Do not let your strands drape over each other, or they will start to stick and mold together. We usually will divide the dough into 2 portions and roll it out on 2 separate surfaces, and just leave the noodles flat until we're ready to put them in the pot. When your water is ready, gently lift your cut noodles (a flat plastic spatula or pastry scraper can be helpful if they are stuck to your rolling surface) and toss into water. They will float to the top fairly quickly, so I find it helpful to stir the pot often to make sure noodles boil evenly. 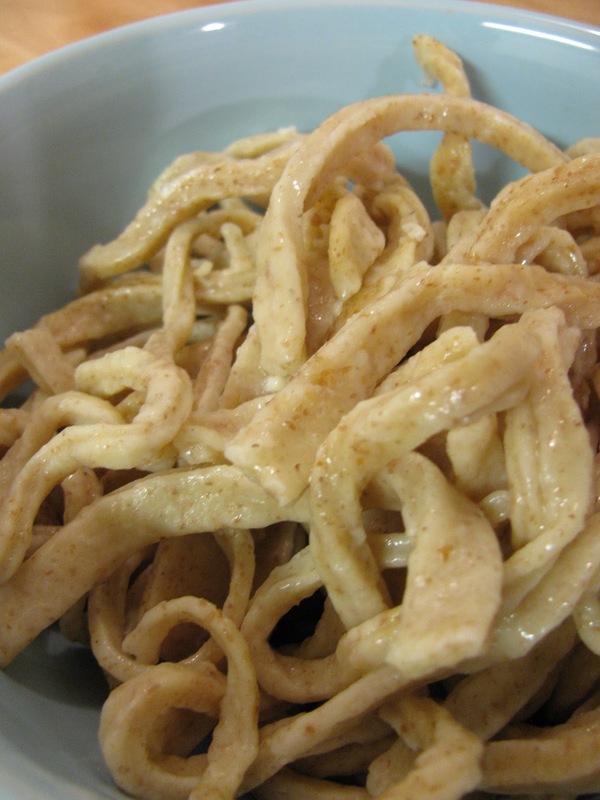 The boiling time will depend on the thickness of your noodles; ours usually take 6-10 minutes. I test the noodles frequently. When they are cooked through to your satisfaction, strain them and add to sauce. We usually put half of the noodles in cream sauce to eat that night and the next day for lunch, and drizzle the rest of the noodles with olive oil (to keep them from sticking to each other) and put in the fridge for a meal in the next few days. Depending on how hungry we are, this recipe usually provides enough pasta for 2 meals (including leftovers). I won't lie, though, when we make this, we eat a ton—it's delicious! It definitely is a more time-intensive meal, but on a day when you can spare a few extra minutes in the kitchen, it is SO worth it. We make this meal as a team—I try to get the pasta dough all put together and resting by the time Mahon gets home from work, then he rolls it out and I cut it. *If you don't have a mixer: Pour flour out in a mound on a clean countertop. Create a well in the center of flour; add eggs and salt. With your hands, slowly work the flour into the eggs (starting from the inside of the well and working your way outward). Once everything is combined, add a little bit of olive oil and/or water to help dough hold together (without getting sticky). Knead dough for 10 minutes, cover with plastic, and let rest 20 minutes.